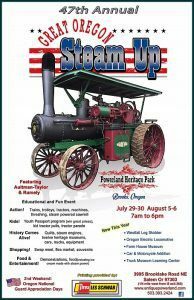 Let off some steam this SKH Weekend at Brooks, Oregon’s annual Steam-Up Festival featuring steam engines or cool down on the river at the annual Portlandia Mermaid Parade that includes a beach party at Poets Beach. Want to get fancy? Try one of the world’s best Pinot noir’s at the International Pinot Noir Celebration in McMinnville or keep it loose at the Three Days of Aloha celebrating all things Hawaiian at Esther Short Park in Vancouver. Try 80 different craft beers, eat pub food, hear live music, and learn about home brewing at Oregon Brewers Festival at Tom McCall Waterfront Park. Children accompanied by a parent are welcome and will enjoy the soda garden. History comes alive. AT this steam-powered fest watch a parade of vintage tractors, trucks, and automobiles at 1:30 p.m. each day; take train and trolley rides; see steam saw milling, tractor pulling, and machinery demos; and visit a blacksmith, country store, and flea market during Steam-Up in Brooks. Move over Aqua-man! 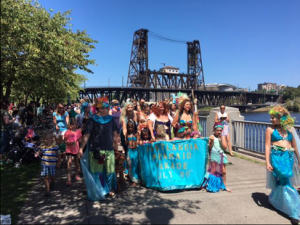 Wear a costume that celebrates ocean mythology for family-friendly Portlandia Mermaid Parade, which begins at noon with a ceremony at the Japanese American Historical Plaza (north of Burnside Bridge), and heads south at 1 p.m. to Poets Beach for swimming and a beach party. Free. The 8 p.m. Siren’s Masquerade Ball for age 21+ has a dress code (no street clothes, no exception). This year’s ball theme is “The Temple of Oceanus” and is a gender neutral, and body positive event. Now in its 31st year, The International Pinot Noir Celebration attracts world-renowned winemakers, chefs, epicures, and wine lovers to Linfield College in McMinnville to taste and enjoy an unparalleled selection of Pinot noir, savor fine food, and tour a vineyard. Time to get your hula on! Three Days of Aloha offers workshops, hula dancing, a 5K run/walk, and a free one-day Hawaiian festival Saturday in Esther Short Park.